With a location which puts you within easy reach of London’s business district, shopping thoroughfares and major tourist attractions, the Hilton London Canary Wharf hotel is an ideal choice for guests looking for comfort, convenience and welcoming service.Make use of the WiFi access and the large desk to get some work done in your stylishly decorated guest room. Watch a film on the widescreen TV or connect your MP3 player to the alarm clock and listen to your favorite song. Check in to an Executive Room or Suite and enjoy extra space as well as exclusive access to the Executive Lounge where a complimentary breakfast and refreshments are available.The 24-hour business center will ensure that you are prepared and connected while the leisure facilities let you unwind and rejuvenate. Make use of the fully equipped fitness center and enjoy the peace of the sauna or steam room. This hotel is home to the popular Canary Wharf restaurant, Cinnamon, where guests and visitors can enjoy the chic mahogany and glass interior while indulging in a signature vodka cocktail. As one of the truly great cities for business, trade and finance, London is the perfect location for conferences, social events and intimate gatherings. 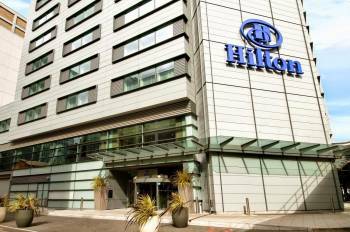 Hilton London Canary Wharf sits in the heart of the financial district, an area steeped in history for trade and business since the middle ages.With more than 1,390 sq. meters of meeting space, the hotel can accommodate events of up to 400 people in one of its eight event rooms. The flexible space is perfect for your event. Host a black tie event in our Quayside Suite or a private dinner in our Executive Boardroom. All events have a dedicated Event Manager offering assistance to organisers from start to finish and ensuring each event is a success.